Are Bitcoins Better Than Gold? There has been a raging debate — particularly over the last couple of months — amongst libertarians, Austrian school economists, and other defenders of the free market. That debate is over Bitcoin. While I have seen many debates over religion and abortion, I did not think I would see such heated opinions over a digital currency. But the debate over Bitcoin actually resembles a debate over religion to a degree. When there is a debate about religion amongst a group of libertarians, it doesn't revolve around religious policy. Instead, there is typically unanimous agreement that people should be free to believe whatever they want, as long as they are not forcibly imposing their views on others. I haven’t heard any advocates of the free market say using Bitcoin should be illegal. I’m sure there is somebody out there who has, but any true advocate of a free market would not oppose the use of Bitcoin on a voluntary basis. One of the big debates is over whether Bitcoin can function as money. First, it is important to define money. Money is a medium of exchange. It's something that is sought after by the general public, and it is the most marketable thing in a society. People seek money not because they can eat it or wear it, but because they know others will accept it, and it can therefore be used to obtain goods and services. A society needs money to function. Without money, society would be very primitive, with a low division of labor. Let's say you have a pair of shoes you want to sell so you can obtain a basket of fruit. Can you imagine how hard this would be without a medium of exchange? At this point in time, bitcoins are not money. Perhaps they are on a very limited scale in very niche markets, but they're nothing close to widespread. If I walk up to 10 different people on the street and ask them their thoughts on Bitcoin, probably at least half will give me a blank stare back. Try walking into a major retailer or major restaurant and paying with your bitcoins. They will likely look at you as if you are crazy. Of course, in this same sense, gold is not money either. You can’t walk into most stores and pay with gold. If you live in the U.S., then the U.S. dollar is money — whether you like it or not. It has slowly been imposed on us by the government and central bank over the last 100 years, but it still serves as money. You can go almost anywhere in America, and people will be more than happy to accept your U.S. dollars. While many proponents of the free market would like to see a gold standard, the reality is that the U.S. dollar serves as money today. Actually, it isn’t so much that some people demand a gold standard — it's that the government should not interfere with what is used as money. Gold and silver were used before major government interference, but gold and silver were selected by the marketplace. Aside from the fact that both have the potential to be used as money — and perhaps as investments — there are quite a few differences between a bitcoin and a piece of gold. The obvious difference is that you can physically touch a piece of gold, whereas bitcoins are digital and do not physically “exist.” You can’t hand someone a bitcoin. Proponents of Bitcoin will say their currency of choice offers privacy. In addition, there are a limited number of bitcoins to be “mined,” preventing or limiting currency depreciation down the road. But in terms of privacy, I still believe holding physical gold is the better choice. And while gold has been given rough treatment by governments taxing “capital gains” (which is really just in terms of the government money), there is nothing that prevents governments from imposing restrictions, regulations, and taxes on bitcoins. In fact, it was an announcement by the Chinese government in early December prohibiting financial institutions from dealing in bitcoins that sent the Bitcoin market down. All of the hype over Bitcoin is because of its price in terms of U.S. dollars. 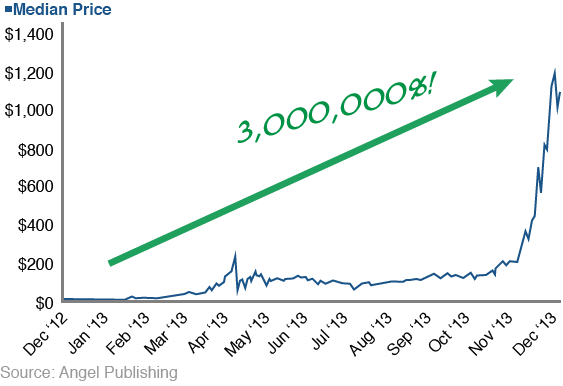 It went from under $15 per bitcoin at the beginning of 2013 to briefly over $1,200 in late November. It is now around $760, but that may be a lot different by the time you are reading this due to the extreme volatility. But the big story is how much bitcoins are worth in terms of U.S. dollars because people still seek dollars. Even a smaller store or restaurant chain would have been highly noteworthy. But it seems most people are interested in buying bitcoins so that they can make a “profit.” That profit would be in dollars. So what is the difference with gold? It is true that gold does not generally serve as money, even though this was imposed by governments. It is also true that a lot of people buy gold so that they can profit in terms of dollars. Gold has a tradition of being used as money for thousands of years. Bitcoin has only been around for a few years. I think when it comes down to it, people understand gold, and they trust gold. They have a grasp of both the long history of gold and its current use as a hedge against disaster and inflation. If you bought some bitcoins a year ago and held onto them, then I congratulate you. You made some major dollar profits. But they will probably only be worth something to you if you sell them back to someone else for your true money at some point in the future. If you are looking to invest in bitcoins, then you should look at it as a speculation. I doubt bitcoins will start being used as money any time soon, even though I would love to see some competition to the dollar. Just know that if you are going to dip your toe into the bitcoin water, you will be taking on some risk. But as with most investments, what is high-risk can also be highly rewarding. That being said, over the long haul, there's still gold, which certainly has history on its side. If you're looking to start the new year off right, consider a resolution to save more money and eliminate your debt. It's not the easiest thing in the world, but with a few simple (and small) steps, you can definitely get on the right track to financial freedom. Should You Invest in Residential Real Estate? Is it time to buy real estate again? Heading into 2014, real estate could serve as an excellent hedge against coming inflation. The key, however, is finding the right house, in the right area, and at the right price. Don't let the Fed's recent announcement fool you. Cutting $10 billion a month off an $85 billion buying spree only exacerbates the problem. The Fed really has no idea as to how to get out of the mess it created.